The main goal in this game is to earn money to restore your destroyed shelter. Drag your little hero around the screen to collect coins and kill enemies. Use your mouse to guide him. You have limiter number of moves per level. This game is one of my favourites for the last month. 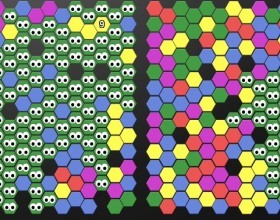 Your task is to change your colour in order to infect the same coloured hexes near you. Infect all screen as fast as possible. Use minimal number of moves. When playing against computer your task is to capture more elements than your enemy. 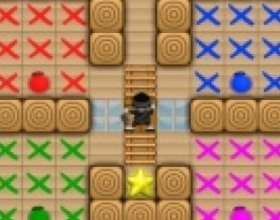 Your task is to match all coloured blocks to clear the level. Use your mouse to drag them around the screen. 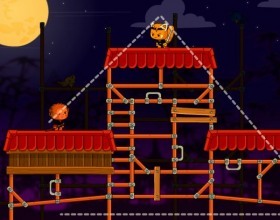 Game becomes really challenging by each level, some levels will be really tricky. This is a classical bejeweled game turned into something much interesting. 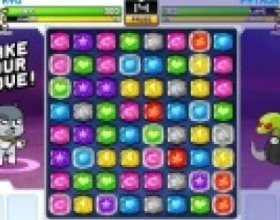 If you have played social game Bejeweled Blitz, then you'll find this really similar. Keep removing and matching at least 3 same coloured shining diamonds. Watch out for those with timers on them. Try to remove them first. This is a little bit beautifully designed version of classical bubble shooter game. Have a lot of fun to complete level by level in this nice bubble shooting game. For those who don't know - you have to match at least 3 bubbles of the same colour to remove them. The goal is to clear entire field. This is a classical lines game turned into massive online multiplayer game. With this opportunity you can play against other players or your friends from all world in real time. Your task is to get five balls in a row before your opponent does the same. Everybody loves bubble shooter games. Here's another version of this classic game. Match 3 or more of the same coloured bubbles to remove them. That's it - enjoy :) Use your mouse to control this game. Your task is to move your cursor through the squares to light them up. You can cross an empty hex square only once. But not all levels will be that simple. Some of them have special cases, like cross it twice, or cross it in the right order. This game is follow up to previously added game Digital Upgrade. It's a mix of two game genres - tetris and match 3 puzzle. Your task is to rotate and drop pairs of monsters and other icons to match 3 of them. Use arrow keys to control the game. 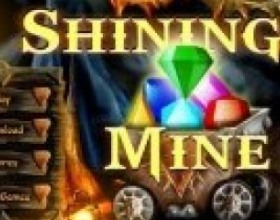 This is a great multiplayer online game where your task is to enclose the squares, capture gems to get more points and avoid from skull enclosing. Use your mouse to play this smart dots game and beat all real opponents. 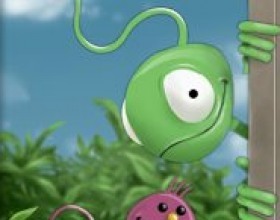 Your aim is to connect coloured links and then remove them in order to collect funny creatures. 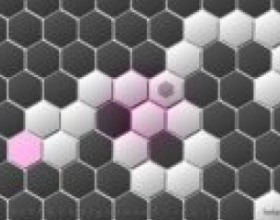 Click on those chains of blobs with the same colour to remove them. Collect required number of creatures to pass the level. 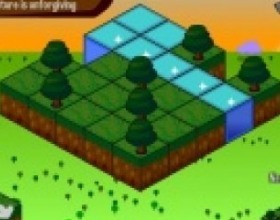 Your task is to click on the trees to remove them and avoid from killing other trees. Follow game tutorial to learn how this works. Later you can use a shovel to remove ground areas. Use Mouse to control this relaxing game. 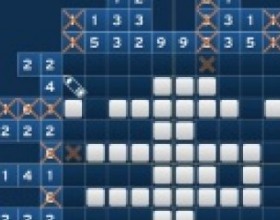 All lines, tetris and match 3 game fans - this is for you. 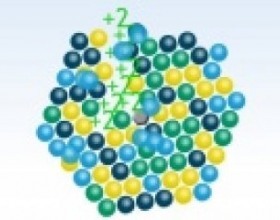 In this game your task is to match at least 3 items so they can create a new element. You can play until game board is filled. Use Arrows to rotate, move and drop elements. 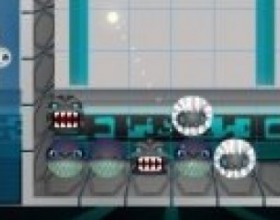 3 Crazy scientists have to connect net bots according to given schemes located on the left side. Click and hold mouse button and move your cursor through bots to create corresponding figures. This game requires a lot of thinking and logic. Your task is to guide the black sphere into the hole. You can use various tools like ramps, bridges, arrows and different size blocks to reach your goal. Use Mouse to select and place available blocks. Click on their icons twice to rotate them. 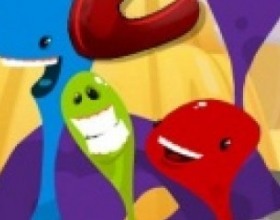 Bubble Shooter is one of the most popular online game of all time. Play this sequel to classic flash game. Accurately shoot bubbles onto spinning shape to match at least 3 bubbles in order to remove them. Use your mouse to aim and shoot the bubbles. 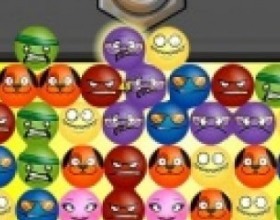 Click on the groups of blobs in order to remove them and give other blobs chance to stick together with others and then remove them too. Use Mouse to play this game. Use various special powers inside blobs. I bet you like match 3 games. But what about turn-based fighting? And if we combine these 2 games in one? Your task is to defeat your enemy by matching 3 or more gems to gain some skill and use it against him. Use Mouse to swap gems. 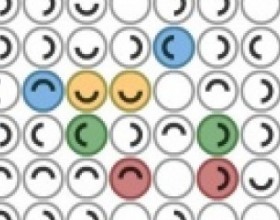 Your goal is to match at least 3 smiling balls in order to remove them. Aim with your pipe and drop balls to other same coloured balls to make them disappear. Use Mouse to aim and drop the ball. Switch balls by pressing Space. Your aim is to match at least 3 equal gems in one line to collect them and be able to defeat your enemies. You are able to do 2 moves per turn. Only if you match more than 3 elements you'll get an extra turn. 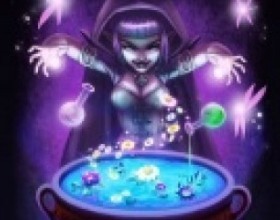 Earn money to buy new spells and equip various items. Use Mouse to play this game. Help the Ninja Painter to paint required walls in right colours. He's a professional and super fast house painter. Select current colour by moving over it. Go through marked areas and try to collect all the stars and then reach the exit door. 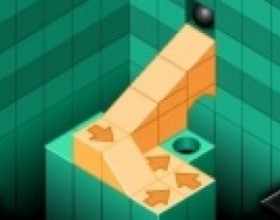 Use the Arrows or Mouse to move. Remember how you played Battleships using paper and pen with your friends? 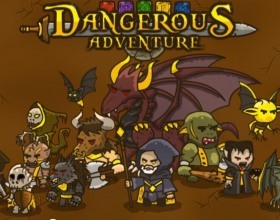 Now you can play the same game in cool graphics with additional features and options. Destroy enemy before he destroys you. Use mouse to aim and fire. 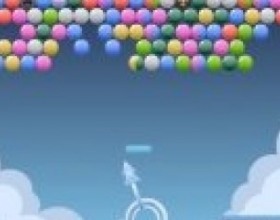 As always in Bloons games you have to pop required number of balloons to progress the game. 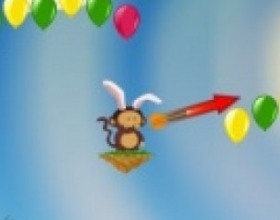 Help little monkeys to pass all 48 Easter package levels. Use Mouse to aim, set up the power and fire. In this mind blasting game you have to click on the cells to fill the rows and columns with required number of items. If there's more than one number at the side it means that there's a space between blocks. 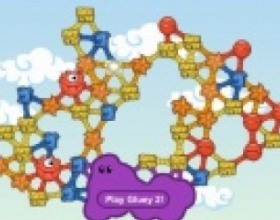 Anyway use detailed instructions in the game to solve these nanogram puzzles. In this cool puzzle game you have to remove all coloured pieces from the screen. You have to complete level by using only 5 moves. You can get extra move by removing lots of balls per one move. Each piece has determined direction. Click on it and watch how it goes around the board. Incredibly fantastic crosswords game, where you have to place letters at the right positions and combine whole puzzle. Don't worry, you do need perfect English skills to play. 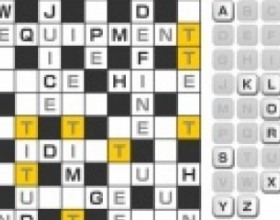 Select a box and click on the correct letter and see how it match in the crossword. Your goal is to protect your castle. To do that you have to match 3 equal elements to gain resources and power-ups. Use earned gold to upgrade your warriors. Match more than 3 elements to get more power and destroy your enemy. Use mouse to swap elements. Intellectual computer games are now of a great interest and demand, as it is scientifically approved that they positively influence mental development and, therefore, can be used for the educational purposes. The most famous match game which now, though, is much forgotten is, undoubtedly, Tetris. The idea of playing match games is that the gamer has to manipulate different objects (lines, tiles, figures, sticks, etc.) in order to create a needed pattern. These objects are sometimes hidden and the gamer has to find out their location. 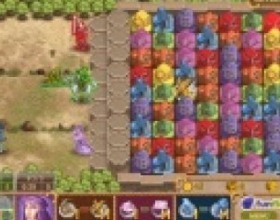 The pattern must be built in accordance of a certain colour or number scheme or in a certain sequence, identified earlier by the game requirements. Often the objects disappear if a certain configuration is built. 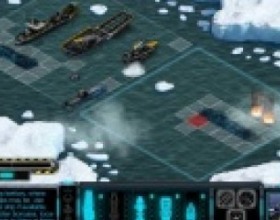 Thus, the main goal in such games is to avoid a certain critical level when constantly arriving elements do not have enough space to build them in a needed configuration and make them disappear. In these games the gamer usually has three lives. 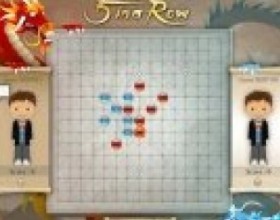 It is also possible that the player loses because there no elements which can be matched left. Objects can be organized either horizontally or vertically. The gamer can match either the elements that have already fallen down, or those that are still moving. 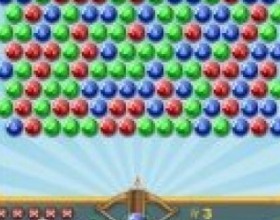 The main difficulty in succeeding is that the player has to recognize possible successful combination of elements, as the board is always chaotic and overloaded with objects. 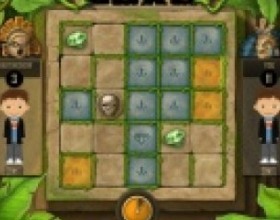 Match games often include elements of puzzle games. They vary in the levels of complexity and, thus, can be played by people of all ages. 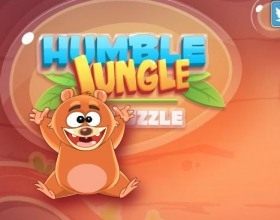 Although usually they do not represent any really difficult tasks and with gaining more gaming experience the players can manage them quite successfully and in most cases win. Match games often include time restrictions. Actually there are no match games without time limits except the very early editions of 1980s. The amount of time is becoming less with proceeding to the more complicated game levels. The amount of objects is increasing as well, so logical thinking and quick reaction are indispensable. Obviously more points are given for finishing harder levels. Quite separate subgenre of Japanese games developed within match games. Match games are widely represented in various online resources, therefore, can be found quite easily, without spending much time and efforts.